A traditional mode of enjoyment, especially for ladies, with its allusions in the works of Kalidasa, a second century Sanskrit poet, and other classical poets of early days, the swing as a sport has a long past and has developed around it as many connotations. While the classical system of Indian music sought to visualise its Raga Hindola using the imagery of swing, the swing assumed the pivotal role in defining Shravana, one of the India’s foremost festivals and the subtlest expression of a brother’s love for his sister and commitment for her protection, and a sister’s perpetual desire for her brother’s wellbeing. In the Baramasa illustrations also swing defines the month of Shravana. After there developed the cult of Vaishnava bhakti – the deity’s devotional service, the swing entered into its domain; and, in the twenty-four hours’ cycle of the service rendered to the deity, especially the child Krishna, the swing was attributed a regular session : a practice still followed. A swing riding young Krishna, by himself or with Radha, usually on the branch of a Kadamba tree in an isolated forest corner, is now for centuries one of his most loved visual manifestations. The swing-vocabulary travelled farther into other domains. The metaphysicians, theologists and even the modern psycho-analysts, have been long using it – the imagery of swing, for defining the wanderings of self and a vacillating, wavering or indecisive mind, and aestheticians, poets and painters, for revealing bodily charms for when swinging with her arms raised, legs stretched and hair blowing with the wind the figure of a woman revealed its utmost beauty and grace. The entire medieval feudatory had across centuries in its gardens and palace parts provisions for a swing, and not only the modern elite, a bureaucrat, or a rich trader but even a middle class household takes pride in having a swing in its lawn, veranda or courtyard. A timeless theme of Indian art as also life, the swing did not fail in attracting the fancy even of the modern painters like Raja Ravi Varma, despite working under the influence of European art styles. 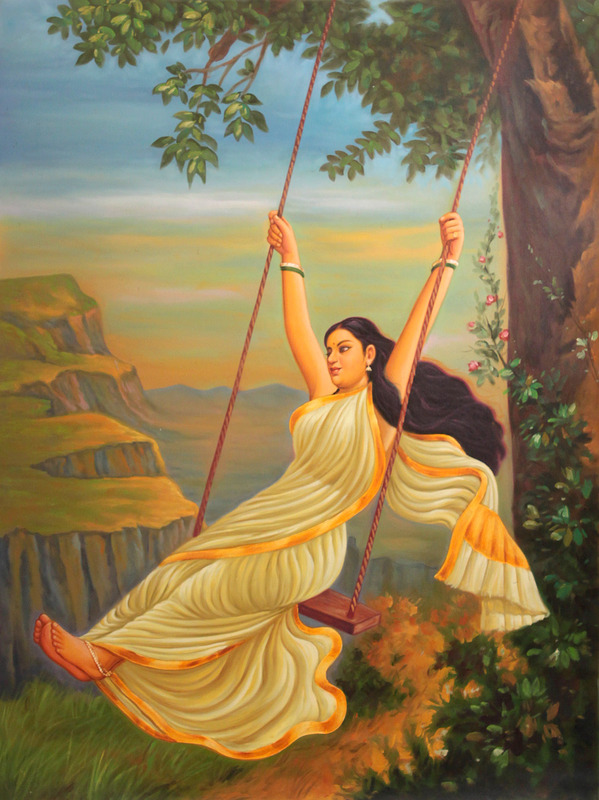 Portrait painting was more often their choice but the swing-theme which gave them ample scope for combining with the portrait of a young person engaged in an exercise which exposed her to her most bewitching charms and figural grace the magic of a natural surrounding, also gained from them as much favour. Exactly in the style of late nineteenth century modern art sharing European technique, as it manifested in one of the paintings of Raja Ravi Varma on the theme, in all likeliness the artistic model of this art-piece, the artist has wondrously defined his canvas with a receding perspective and a merging centre for the portrayal of his figure of the lady, the painting’s primary concern. He has drawn his background with a high sky but not without a horizontal line and without binding it on all sides : on two sides by the huge tree holding the swing, the side opposite it, by a set of diffused forms of a hill range, and the bottom, by grass and marshy plants growing around. This yields the centre – merging, point of the canvas against which the portrayed figure gains utmost focus. All forms : the tree, hill-range, horizontal line and plants towards the bottom, are widely diffused – a most characteristic feature of the modern art lest they diverted viewing eye from the main theme. It is only a rose creeper with flowers on it rising along the tree, just close to the lady figure, that has not been diffused like other forms. It alternates the floral rings that adorned the European portraits of those days, a feature also shared by Indian modern painters. This large size canvas portrays a young damsel, clad just in a sari and minimum ornaments, a chain on her feet, a pair of green and white bangles on each of her wrists, a lace of black beads around her neck, a ring on one of her fingers, and canopied pendants on ears, enjoying a swing : a piece of a wooden sleeper suspending along a rope from the branch of a huge tree. Though twisted with cords of two or more colours, the rope and the wood-piece are quite simple. Except its deep waving folds creating variegating colour-effects and a broad saffron border – shining but plain, her sari, rendered in opaque yellow, light and dark, is a simple length of textile. Most luxuriously floats her hair to her left affording pleasant contrast to her effulgent figure, her gold-like glowing arms, and rose-like radiating face. True to the concept of the lotus feet, as it prevailed in early aesthetics, the figure is endowed with gently conceived feet revealing silken softness of lotus petals. Her dreamy eyes, sharp features, oval face, cute lips and a well defined neck, all reveal exceptional beauty and grace.